A stroll around the park may soon be enough to charge the raft of batteries needed in today's power-hungry gadgets. US and Canadian scientists have built a novel device that effortlessly harvests energy from human movements. The adapted knee brace, outlined in the journal Science, can generate enough energy to power a mobile phone for 30 minutes from one minute of walking. The first people to benefit could be amputees who are being fitted with increasingly sophisticated prosthetics. "All of the new developments in prosthetics require large power budgets," Dr Douglas Weber of the University of Pittsburgh, and one of the authors of the paper, told BBC News. "You need power to run your neural interface; you need it to run your powered joint, and so on. "Getting that power is going to be really important." The new device generates power by a process known as "generative braking", analogous to the braking systems found in hybrid-electric cars such as the Toyota Prius. "Walking is a lot like stop-and-go driving," explained Dr Max Donelan of Simon Fraser University in Burnaby, Canada, lead author of the paper. "Within each stride muscles are continuously accelerating and decelerating the body. Hybrid electric cars take advantage of stop-and-go driving using so-called "regenerative braking" where the energy normally dissipated as heat is used to drive a generator. "We have essentially applied the same principle to walking." Using a series of gears, the knee brace assists the hamstring in slowing the body just before the foot hits the ground, whilst simultaneously generating electricity. Sensors on the device switch the generator off for the remainder of each step. In this way, the device puts less strain on the wearer than if it was constantly producing energy. Tests of the 1.6kg device produced an average of 5 watts of electricity from a slow walk. "We also explored ways of generating more electricity and found that we can get as much as 13 watts from walking," said Dr Donelan. "13 watts is enough to power about 30 minutes of talk time on a typical mobile phone from just one minute of walking." However, to generate this amount of power the generator had to be constantly switched on, which required more effort from the wearer. The knee brace is the latest development in a field known as "energy harvesting". The field seeks to develop devices and mechanisms to recover otherwise-wasted energy and convert it into useful electrical energy. "We're pretty effective batteries," Dr Donelan told BBC News. "In our fat we store the equivalent of about a 1,000kg battery." Tapping this power source is not a new idea and has been exploited in everyday devices such as wind-up radios and self-winding watches. The US defence research agency Darpa has a long-standing project to tap energy from "heel-strike" generators implanted in soldier's boots and powered through the pumping motion of a footstep. And in 2005, US scientists showed off an energy-harvesting backpack which used a suspended load to convert movement into electrical energy. However, heel-strike devices generate relatively little energy whilst people using the backpack have to bear the burden of carrying the bag. "It requires a relatively heavy load - around 38kg - to get a substantial amount of power," said Dr Donelan. Simulations showed that a soldier carrying the pack and walking at a relatively brisk pace could generate around 7.4 watts of power. 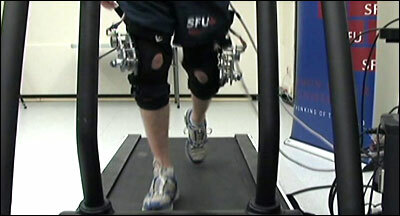 "It's about the same amount of power as [the knee braces] produce," said Dr Donelan. The team believes the new device could have many uses. The technology could be used to make "smart prosthetics"
"I think the early adopters will be people whose lives depend on portable power," he told BBC News. "On the medical front, portable power is used by those who have amputated limbs to charge their powered prosthetic limbs," he said. However, Dr Art Kuo at the University of Michigan does not believe it will be simply a case of strapping the device on to an existing prosthetic. "It would probably involve building a new [prosthetic] knee that uses some existing ideas and then also tries to harvest energy using these principles," he said. The team also hope the device could be useful for people who have suffered a stroke or spinal cord injury who wear an "exoskeleton" to help them move. "The current and future emphasis is on powered exoskeletons," said Dr Donelan. Soldiers may also benefit from wearing the knee brace to power the multitude of devices they now carry ,such as night vision goggles and GPS. "They treat batteries like they treat food and water - they are so essential to what they do," he said. Dr Donelan has now set up a spin-out company to exploit the technology and believes it will eventually be possible to develop a small device that can be fitted internally across different joints. However, in the short term he has his sights set on a light weight, slim-line version of the knee brace. "That's about 18 months away, so it's not science fiction far in the future stuff," he said.